NIRI is an near-IR imager/spectrometer operating over the 1 to 5um wavelength regime. The instrument is cryogenic and is cooled by two Leybold closed-cycle cooler units to an IR array operating temperature of around 30-35K. All optical elements inside the NIRI cryostat are cooled and, in general, will reach operating temperatures of around 60 to 80K. Since NIRI is cryogenic, the cryostat is pumped and cryo-cooled to a pressure better than 10^-5 torr. The telescope beam passes through the entrance window of NIRI to a beam splitter wheel which directs IR radiation to the NIRI science channel and the optical radiation to the On-Instrument Wavefront Sensor (the OIWFS). A separate web page describes the OIWFS optical channel. 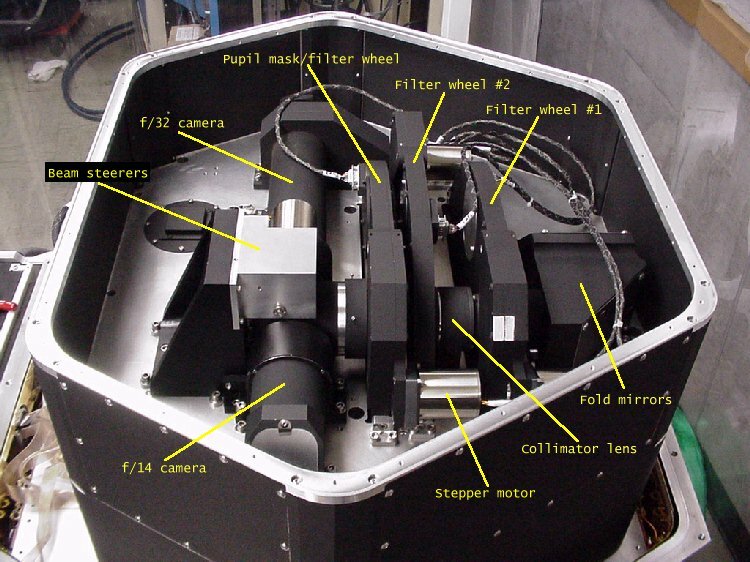 After the beam splitter wheel, the telescope beam is focussed onto a focal plane mask wheel (containing, for example, spectroscopic slits). Next the beam passes through a field lens and via two folding mirrors (#1, #2) reducing the physical path length inside NIRI, onto the first of two filter wheels. This filter wheel, #1, is not located in a collimated beam amd will generally contain broad-band filters and passband blockers. After filter wheel #1, the beam is collimated by a collimator lens and next passes through the second filter wheel, #2, where narrow band (interference) filters will be located. Next in the optical chain is a pupil mask/filter wheel where an image of the primary(secondary?) is formed. After this, the collimated beam is steered (via steering mirror #1) into one of three camera lens units giving the three pixel scales available (i.e. f/6, f/14 and f/32 giving 0.116, 0.050 and 0.022 arcseconds/pixel, respectively). A pupil viewer lens system can be introduced into the f/32 beam to allow direct imaging of the pupil (Gemini secondary mirror, M2). Finally, a second steering mirror ( #2) send the converging telescope beam to focus on the IR detector. A schematic of the layout of the NIRI optical path including the baffling elements is available at the following link: NIRI Optical Path/Baffling. Below is a flowchart of the optical elements in the NIRI science path from the entrance window to the the near-IR array detector. Click on any element for more details of its design and function. Photographs of the optical path elements are included when available.